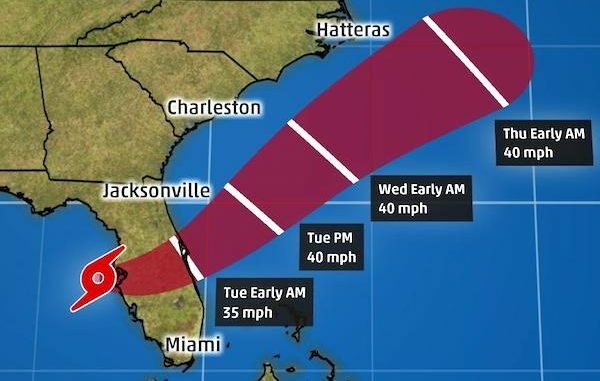 SEBASTIAN – Tropical Storm Emily formed Monday morning on the west coast putting Sebastian and Vero Beach in its path as it crosses Florida. Tropical Storm Emily is expected to bring Isolated strong storms with frequent lightning and gusty winds of around 50 mph to Sebastian and Vero Beach. As of 9 a.m., the center of Tropical Storm Emily was approximately 35 miles west-southwest of Tampa. Emily is moving directly east at approximately 8 mph and this path is expected to continue today, the National Weather Service said. However, a slight turn to the northeast and an increase in speed are expected tonight and Tuesday. Emily is expected to move inland over the west-Central Florida peninsula later today and across Central Florida into Monday night. The Tropical Storm will then move through Florida and offshore of the east-Central Florida early Tuesday morning. Emily is expected to weaken to a tropical depression while it moves through Sebastian and Vero Beach tonight. Expect heavy rainfall today and tomorrow, wind gusts of 50 mph, and possible flooding in certain areas in Indian River County. UPDATE (6:45 p.m.): Tropical Storm Emily has been downgraded to a Tropic Depression with 35 mph winds and not expected to regain tropical storm strength. The East Coast of Florida is not expected to get sustained tropical force winds but heavy gusts are possible. Heavy rainfall and the potential for associated flooding will remain the primary threat from this weather system. Emily is expected to produce 1″ to 2″ of rainfall in most areas with up to 4″ to 8″ in Sebastian and Vero Beach. It remains on the forecast path to cross the central peninsula through late evening eventually moving offshore of the Florida east coast around Cape Canaveral after midnight. Numerous showers and scattered thunderstorms with periods of heavy rainfall are expected throughout the evening and into the early morning hours. Widespread rainfall amounts of 1 to 2 inch with local amounts up to around 4 inches are expected through tonight. Areas that receive heavy rain today will be susceptible to localized flooding, especially low-lying and poorly drained areas. Monitor media reports for continued information. Rain chances will quickly diminish late tonight as the center of Emily moves off the east Florida coast. Use extreme caution while driving.